It’s time to make Micromax Mobile’s inspiration your muse. 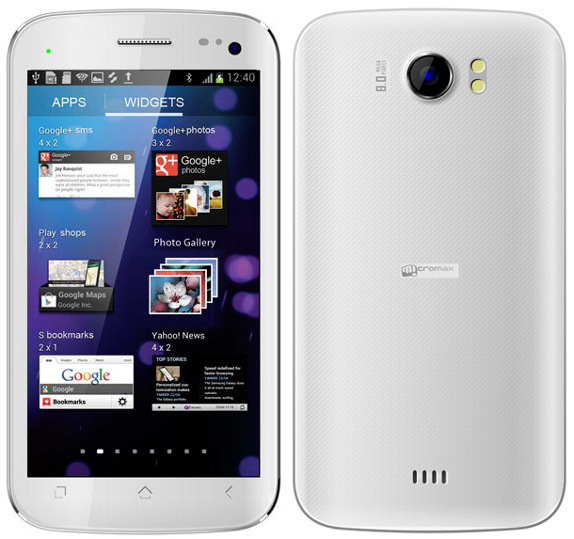 Micromax A110 SuperFone Canvas 2 is here in the market to get your creative juice flowing. The company eyes the bigger slice of India’s smartphone users by launching this extremely innovative and user friendly phone. This phone is designed and floated in the market for money conscious patrons who don’t believe in paying a humungous price for latest technology. This budget phone is all set to woo smartphone epicureans with its sleek design and exciting apps. It flaunts the brilliance of Android 4.0.3, Ice Cream Sandwich platform. The colossal 5-inch FWVGA capacitive touchscreen comes alive with the touch of 480 x 854 pixels. A 2,000mAh Li-ion battery adds consistency to a suave browsing experience of 180 hours. The propulsion of 1GHz dual-core processor helps you kiss the sky of fun. The advanced processor makes you the moghul of all eye-glittering apps on Google Play. Another prime aspect of this phone lies in its camera. The quality of camera, as we all know, plays a decisive role in the customer’s decision making process. Few mobile phone companies channelize a significant portion of their time and resources to follow their objective of refurbishing their shutter quality. Micromax didn’t wait for a long time to take a cue and their wisdom is well reflected in the 8-megapixel CMOS camera of this smartphone. The dual LED flash guarantees an immaculate shooting expedition and its efforts are well complemented by multiple camera settings. These settings help you to end the chapter of remorse that is usually followed by a failed attempt of capturing the picture perfect moment. You won’t snap with irritation anymore as your every picture will have the perfection of the right brightness level, unhindered by the shadow of darkness. The front camera on this phone allows the user to make video calls. File transfer happens swiftly and the highway of 3G, GPS, Wi-Fi and Bluetooth, seldom slows you down with roadblocks. So this Christmas, don’t forget to light the candle of excellence by dappling in the glow of online shopping. Everything is good with the Micromax smartphones but, the biggest concern about their phones is pathetic battery life!